Earnings Per Share is one of the most important factors that investors need to keep in mind while selecting a stock for long term investment. As the name itself suggests, it is the earnings or profit allocated to each outstanding shares of a company and it servers as the prime indicator of a company's profitability. Earnings Per Share or EPS is the only indicator that directly comes in the results of every Indian company. Did you ever come across this while reading through the results sheet?? EPS or Earnings Per Share is defined as the ratio between Net Income and Total Number of Outstanding Shares. For example, lets take Arrow Greentech which has 1,17,39,948 outstanding shares as per BSE. Now according to its 2016 March Annual results, net profit after tax for last financial year is Rs. 30,36,92,000. Divide Net Profit with number of outstanding shares will give an EPS of 25.87. The value we got now is basically simple EPS. As most of you are aware, there is a stock category called Convertible Security. It is an investment that can be changed into another form. The most common convertible securities are convertible preferred stock, which can be changed into equity or common stock. A convertible preferred shares pays a preferred dividend and specifies the price at which it can be converted into common stock. Stock Options given to employees and warrents are examples for Convertible Security. Now think about a scenario where all these Convertible Security are eventually converted to fully paid stocks. This will increase the denominator of our EPS equation and the outcome is low EPS. Why Market Price of a Stock is always higher than EPS? We can explain the rationale behind this price difference is explained with the help of the stock we mentioned above - Arrow GreenTech. 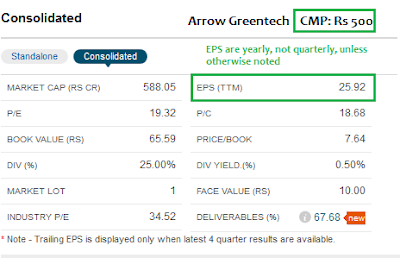 The current market price of Arrow GreenTech is Rs.500. The trailing EPS is approximately 25. This simply means that if the growth rate of the company is zero, this stock can generate Rs 25 every year to each stock which can be received as dividend. Now lets assume a hypothetical case where market crashed and the stock price of Arrow went down to Rs.50. We will surely jump and buy this stock in truckload. why?? Because, if you are able to buy this stock @50, in just two years company can give back that 50. (EPS of 25* 2 Years). Now more people will come to know about this highly undervalued stock and they all are willing to buy the stock at a high price. Cash EPS is operating cash flow divided by diluted shares outstanding. Cash EPS is considered as more important and accurate than other EPS numbers, because it shows the real financial strength of a company. Cash EPS is better because operating cash flow cannot be manipulated as it represents real cash earned, calculated by including changes in key asset categories, such as receivables and inventories. In nutshell, a company with reported EPS of Rs.20 and cash EPS of Rs.25 is preferable for investment to a company with reported EPS of Rs.25 and cash EPS of Rs.20. The EPS generated by a company can go one of two ways. They can be retained, reinvested in the company, or they can be distributed as a dividend. Always look for companies which pay you back the money as dividends or invest the money wisely to generate more topline growth. In nutshell, a company with reported EPS of Rs.25 and cash EPS of Rs.20 is preferable for investment to a company with reported EPS of Rs.25 and cash EPS of Rs.20. nice article :) thanks a ton.